The word mirror has several definitions. It can be a noun or a verb. The definition of a mirror that I will be using is a reflecting surface for use in viewing oneself.1 So,what is the purpose of a mirror? To take in how you look. I completely understand that this can be done without judgement. There are people out there who can look in a mirror and the thoughts that flow through their mind lack any ounce of judgement, not one speck. Raise your hand if you are one of those people? If you raised your hand, great! The mirror has no power over you. It’s just another object in your bathroom. It holds no more or less value than a tube of toothpaste. If your hand remained in your lap, then realize you are not alone. Mirrors simply provide us with our reflection, but we learned that mirrors can be a tool to help us ridicule and demean ourselves. So many of the TV and magazine advertisements for weight loss systems include a gleeful woman posing in front of a mirror after losing X number of pounds.2 But what if you don’t like what you see because you’ve been taught that you need to look a certain way? I remember a friend of mine in high school commented on when she looked face forward into a mirror, she thought her stomach looked flat and felt great about the way she looked. Then when she turned to look at her profile, she was dismayed and felt fat because her stomach did not appear as flat. What a change in self-esteem in a matter of seconds! I tried this at home later on that day and was similarly dismayed at what I saw. As I look back on this, I realize how easily swayed my friend and I were by the media and how caught up I was in having a better body, including the perfect, flat stomach. And I can’t blame the mirror. The mirror was only doing its job of reflecting my image. 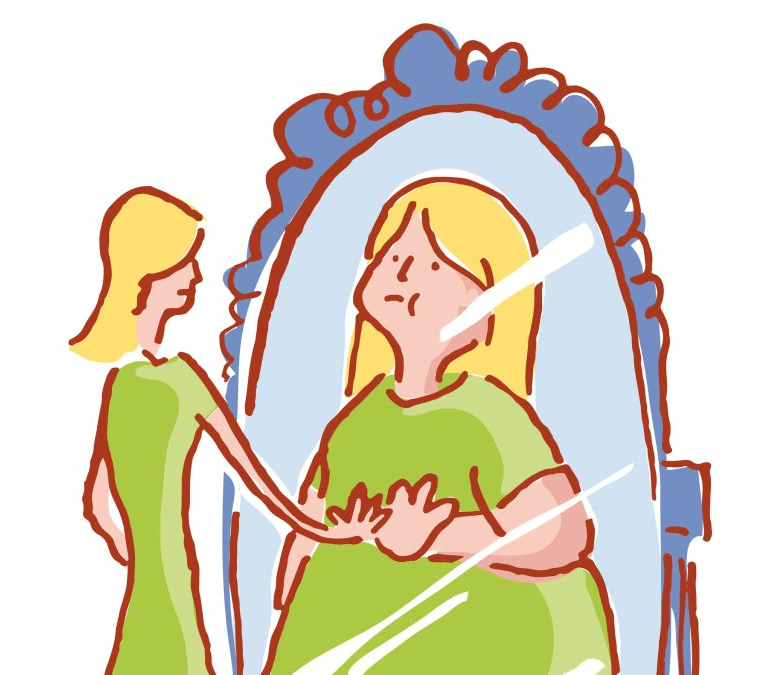 As I got more and more into dieting, I began to use the mirror to mentally reward and punish myself for my weight loss. I would bend over and use the mirror to see how my rolls of stomach fat were shrinking,3 but I would also ridicule myself for even having stomach fat.4 I would congratulate myself on being able to see my collar bone while ignoring that other bones were becoming more and more pronounced. The mirror had become a minor obsession for me5 because I used it as a way to body check, to compare my body to some lofty, unobtainable body ideal. As part of my intuitive eating journey, I decided to make peace with the mirror. I asked my husband to do a mirror exercise with me where we stood in front of the mirror and made non-judgmental or even positive comments about our bodies. My husband was up for it,6 so we stripped down to our undies and began. I did the exercise by myself a few more times after that and finally got around to saying, albeit hesitantly, that I like my body.8 I then said it aloud to my husband a few days after that. I don’t remember if I had ever said that I liked my body. I have been on this planet for over 3 decades, and I don’t think those words ever escaped my mouth until then. It truly was a big moment for me. I am not saying that the mirror is my friend now. I am not saying that every time I look in the mirror, I gush with positive comments, but I am saying that the mirror and I have a better relationship now. I encourage you to try this mirror exercise either by yourself or with someone who you feel cares about you unconditionally and will support you. The idea is that your brain has been taught to say negative things and you need to retrain your brain to think differently.9 Start with one positive comment or neutral descriptors such as “I have brown hair” or “My eyes are blue” if that is where you need to start. But just start. How do you interact with the mirror? Please share in the comment section below! 2I am completely aware that men are also manipulated as well. The diet industry just targets women. 4My warped dieting mind telling me that fat was bad. You actually NEED fat on your body! 5The mirror was Enemy #3. The scale took the top spot followed by my clothes and how they fit. 7My apologies if you see me hogging the shoulder and seated row machines at the gym! 9I go into detail about this in “The ‘Rule’ of Three: Retraining Your Brain”. Take This Diet and Shove It! Wonderful and supporting exercise that encouraged self appreciation of the body one lives in. And like any exercise, one needs to remember that ‘building up’ does take time and repeated effort! I did a mirror exercise that was uncomfortable but also helped me to alter how I saw the reflected image in a more positive way. What I did was look at the PERSON in the mirror and address her as I would a dear friend. It was challenging to talk to that person without dragging in all my previous and immediate reactions that I had created about myself. Really looking objectively at the image as a person, and not a reflection of ‘me’, took conscious effort that I never had to make with any one else. Yes, it is important to stress that appreciating your body does take time. I had to keep coming back to this exercise in order for it to solidify in my mind. I also like your version of my mirror exercise! Looking at yourself and speaking in third person can help you see yourself without judgement (or at least less judgement). I think your words are powerful enough to be on my website twice, so I am leaving both posts up for people to read!